A January birthday?!! What on EARTH would you buy?!! No sooner has Christmas passed when along comes January to offer up yet another dizzying gift buying mission!! As if the last month or so wasn't challenging enough trying to think of different presents to buy...and that was for someone else's birthday!!! "What on EARTH am I going to buy for my loved one?!!" I hear you cry. The answer's quite simple really, why not buy them a PIECE of the EARTH...why not buy them a beautiful piece of jewellery containing that PIECE of the EARTH?!! Why not buy them a Garnet...after all, it is the birthstone of January!! Said to represent the sun in Spanish astrology in years gone by, surely giving a Garnet is the perfect way to brighten up these long cold dark January days!! Not only is Garnet the birthstone of January but it's also the gemstone associated with a second anniversary of marriage and is reputed to be the ultimate gift of love!! The name derives from the latin word "Garanatus" meaning "seedlike" and refers to the stone's resemblance to the seed of a pomegranate...a fruit much revered in some ancient civilisations and said to symbolise love and eternity. Garnets are formed under very high temperatures and pressure within highly metamorphic and some igneous rocks and can be found the world over from India to the US in a kaleidoscope of natural colours ranging from colourless to black!! 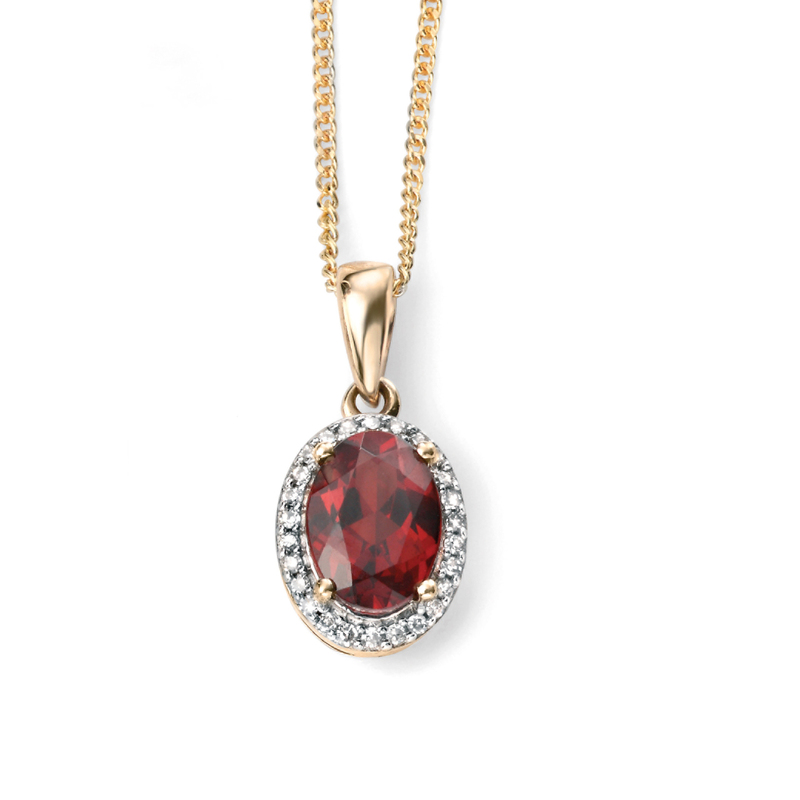 Much of today's Garnet jewellery contains gemstones of varying deep shades of red. Garnet is steeped in history and can be dated as far back as 3500BC where one was found in a necklace around the neck of a mummified body unearthed in Egypt. Romans used carved Garnets in signet rings to stamp wax seals safeguarding important documents. Bohemia, now part of the Czech Republic, was a great source of Garnet and had a thriving industry in the cutting, polishing and mounting of the gemstones. Garnets were very popular in the 18th and 19th centuries and were frequently used in jewellery in Victorian times. According to legend, Noah used a finely cut glowing garnet to illuminate the Ark!! Hebrew writers include the Garnet as one of the twelve gemstones on Aaron's breastplate. In medieval times, Garnets were thought to cure depression, protect against nightmares, relive diseases of the liver and even prevent haemorrhaging. Christian tradition considered the blood-red garnet as a symbol of Christ's sacrifice. The Koran holds that the Fourth Heaven of the Moslems is illuminated by Garnet. The Greeks believed it guarded children against drowning. It was reputed to be potent against poisons and several cultures heated finely ground Garnet to use as a medicinal remedy. Eastern Indians would rub Garnet stones on themselves in the belief that the gemstone's glowing qualities would be transmitted into their glowing wellbeing. The King of Saxony is said to have possessed a Garnet of 465 Carats. A Garnet engraved with the figure of a lion will supposedly offer protection and preserve health. If a Garnet loses its lustre it's a sign of impending doom!! (keep em polished!!). A rare blue Garnet was found in Madagascar and had a price tag of over £1 million per carat...regretably, we don't have any on those!! Why would you NOT have some Garnet Jewellery in your life?! !